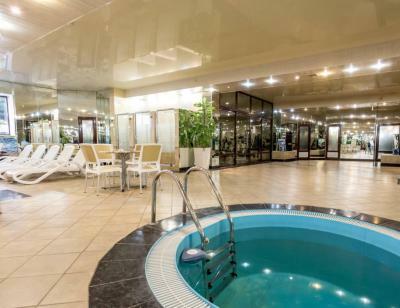 Lock in a great price for Sochi-Breeze Spa Hotel – rated 8.3 by recent guests! Public Transport was easily accesible and check in and out was good. Hotel was clean but it's on a main street, so very noisy and you will not get much sleep. 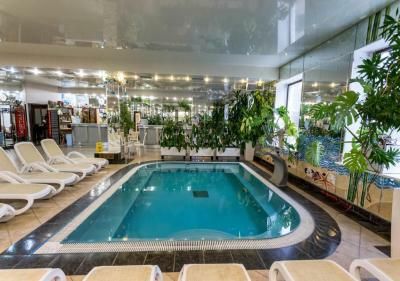 The location was good, 2 KM from city center, right across the bus stand with buses to Rosa Khutor, Adler and the airport. 10 min. by public bus to train/bus station, 5 min. to beach. Everything was good, furniture in room bit dated. Местоположение. Открытый бассейн. Наличие даже аксессуаров каких как тапочки, халаты, зубные щетки, бритвенные принадлежности, фонарик и прочее. Что-то конечно было своё, но всегда приятно, когда видно заботливое отношение к постояльцам. Прекрасный отель, услужливый персонал. В отеле был ремонт, что бы компенсировать это нам дали, бесплатные посещения в спа. Удобно расположен - напротив Дендрария, можно пешком дойти до центра, и близко к набережной. Дизайнерское оформление номеров. Есть номера с видом на море. Открытый бассейн. Охраняемая стоянка рядом. У отеля хороший спа-комплекс, включающий баню, сауну и хамам, хороший большой бассейн с подогревом на улице и внушительных размеров джакузи внутри. Половина номеров с видом на дендропарк, половина на проспект. Номера просторные, весной 2019 в отеле произведен ремонт. Через дорогу канатка. Из/в аэропорт можно уехать на 105 автобусе за 75р, остановка прямо у отеля. 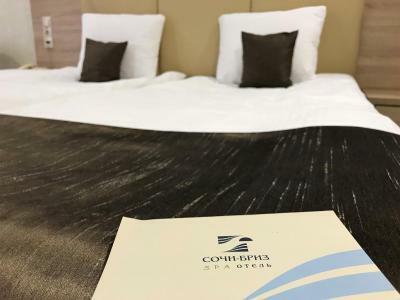 Sochi-Breeze Spa Hotel This rating is a reflection of how the property compares to the industry standard when it comes to price, facilities and services available. It's based on a self-evaluation by the property. Use this rating to help choose your stay! 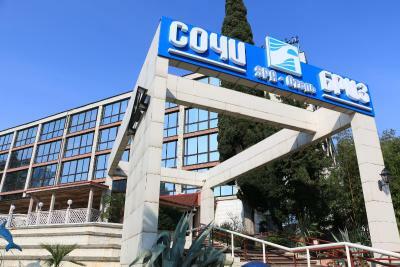 One of our top picks in Sochi.This spa hotel is located along the Black Sea coast, in the center of Sochi city. Free WiFi is available throughout the property. 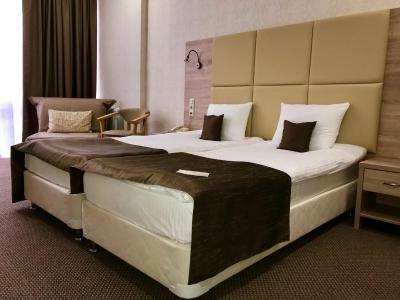 Creatively designed large rooms are air-conditioned and equipped with a mini-bar and TV with satellite channels. A private bathroom is equipped with free toiletries. Guests can visit the unique Park Dendrarium which is within a 3-minute walk away, or travel down further to the coast line to enjoy the sun, breeze and spectacular views. 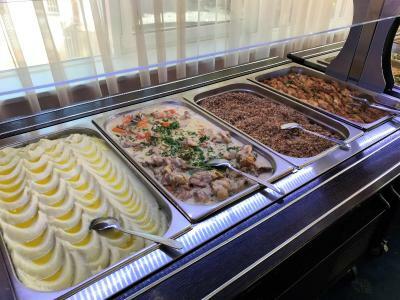 The on-site restaurant welcomes guests for breakfast, lunch and dinner. After a busy day you can relax with a massage at the hotels spa treatment. 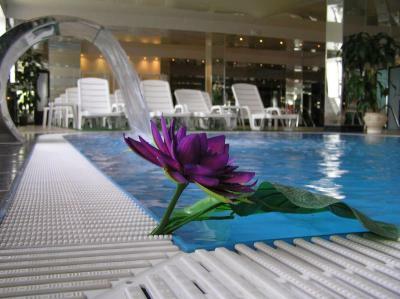 Take a swim in the outdoor swimming pool or exercise at the gym. 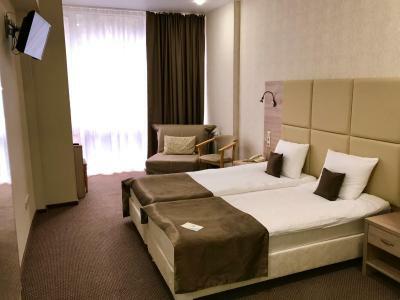 Sochi-Breeze also provides conference rooms and meeting facilities for business travelers. 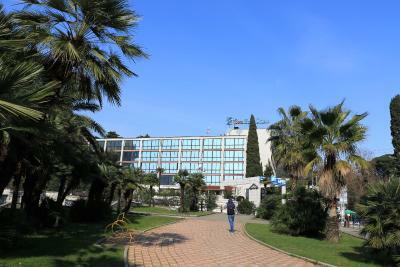 Sochi Train Station is located 1.6 mi away, and Adler International Airport is 16 mi from Sochi-Breeze Spa Hotel. 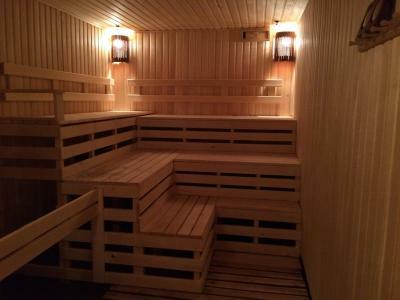 This is our guests' favorite part of Sochi, according to independent reviews. When would you like to stay at Sochi-Breeze Spa Hotel? Air-conditioned room with a mini-bar, a satellite TV and a private bathroom. Spacious suite with separate sitting area, and a bathtub in the bathroom. Features a spa bath and shower. 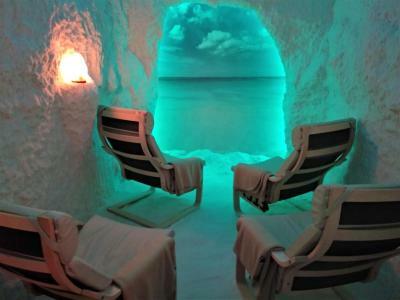 Large suite with a separate sitting area and a hydro-massage bathtub. Individually furnished junior suite with a spacious layout, in-room hot tub and a separate study. House Rules Sochi-Breeze Spa Hotel takes special requests – add in the next step! All children under 12 years are charged RUB 400 per night for extra beds. Sochi-Breeze Spa Hotel accepts these cards and reserves the right to temporarily hold an amount prior to arrival. The hotel is way too old! The aircon in the room makes a lot of noise because is so old! The pictures on website are very far from reality. No english speaking staff, very hard to communicate. 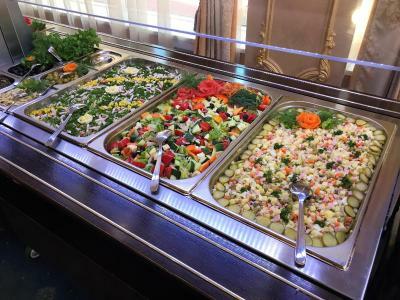 Food was bad :( please improve this...The spa looked really nice but since staff are not speaking english and their offers were in Russian only, was really hard to make any bookings so was useless to us. Indifference reception can't speak English. Noicy room without guests drinking water even. It's an old SSSR style (not only the appearance but also service). I booked a room 3 weeks before arraival but almost 40% higher price than check-in day price. The most important: it's not in the central of Sochi, you should take a bus to anywhere. This made my trip so inconvenient. There is a bus stop at the entrance. No balcony in bedroom also the breakfast was cold, and basic. Lots of hairs in the sugar.